Jaguar is the distributed version of ArrayDB. Simply installing ArrayDB over any distributed file system such as Gluster and Ceph, ArrayDB performed extremely well. We have setup a cluster of computer servers running Glusterfs, which is a distributed file system capable of scaling to several petabytes and handling thousands of clients. We then mounted the Gluster volume on the clustered servers. 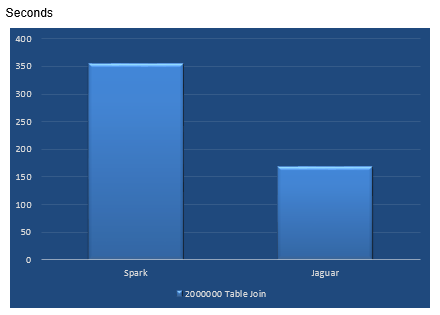 Spark 1.3.1 is also installed on these same servers to benchmark SQL operations on a data set consisting of two million key-value pairs. In Jaguar testing, the data directory in $HOME/arraydb/ is soft-linked to the mounted directory of gluster volume. Then client programs are started on the different clustered hosts. 1. Joining two tables each consisting of 2000000 data items (32 bytes key, 48 bytes value). Result: Spark took 356 seconds, Jaguar took 168 seconds. Result: Spark took 85 seconds, Jaguar took 13 seconds. 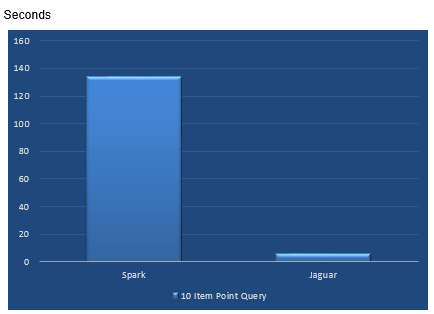 Result: Spark took 52 seconds, Jaguar took 0.1 seconds. Result: Spark took 134 seconds, Jaguar took 0.7 seconds. 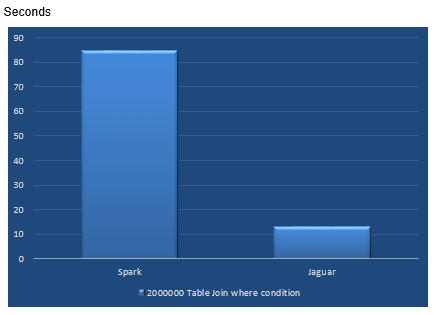 Conclusion: For conditional queries, especially when indexes are used, Jaguar performs much faster than Spark. After six months of hard work on ArrayDB, we are proud to announce ArrayDB 1.0, the next-generation NewSQL data store that delivers high-performance based on our revolutionary array-indexing technology. High Performance: 5,000,000 per minute data ingestion and indexing building at the same time. High performance of data write allows storing data at high velocity. Fast Join: joining of multiple tables at the same time, and at high speed because of fast merge join operation of the unique array-indexed tables. Configurable memory usage: easy configuration of memory usage for fast data load and table join in environments where DRAM resources can be leveraged. More client binding: In addition to C binding, Java and JDBC client API are provided. Any Java application can call native ArrayDB Java API or ArrayDB JDBC to query the fast ArrayDB server. Semi-structured data support: Keys in a table have a schema, but the value fields in a table are schema-less. This feature allows flexible storage of non-structured data as well as fast lookup of key data.